These bags can hold large size shoes and the items you want to put in. The wide opening makes it easy to slide shoes in and out. Shoes of sizes 11.5 (US) and 43 (EU) can be stored as a pair in one bag. This bag is durable, foldable and lightweight; you can put anything you want to pack in. You can take good care of your shoes in travel. 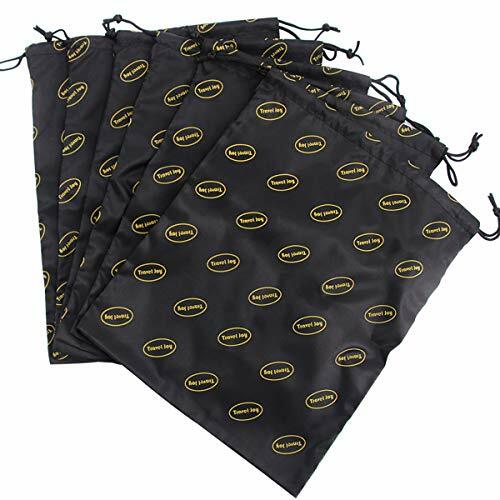 This shoe bags will separate your shoes from clothes or other items and make them clean from soil. When you need to organize the off-season shoes into your closet, the shoe bags will protect your shoes clean. Material: Made of high quality nylon fabric with thick dual drawstring for convenient organization, lightweight, breathable. Clean for your trip: The storage shoes bags helps to keep shoes Separated from other things, making your luggage and closet dust-free and organized! Functional & Versatile: Not only for shoes, can also be used for toys, accessories, toiletries, clothes, or just about anything you want! Not only for travel organizer, but also for closet organizer. Great fit for sneakers, dress shoes, boots, high-heel shoes and sandals, slippers, laundry, shirts and many other luggage essentials. One year NO Questions asked warranty GUARANTEED. Great fit for sneakers, dress shoes, boots, high heel shoes and sandals, laundry, shirts and many other luggage essentials. If you have any questions about this product by Travel Joy, contact us by completing and submitting the form below. If you are looking for a specif part number, please include it with your message.